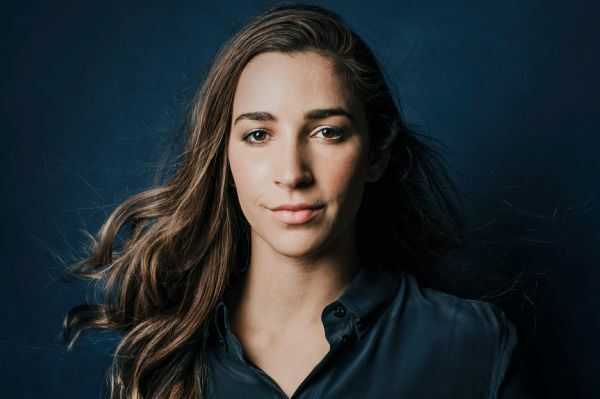 The women who brought down Larry Nassar while taking on Michigan State and USA Gymnastics are honored at the ESPYS with the Arthur Ashe Courage Award. 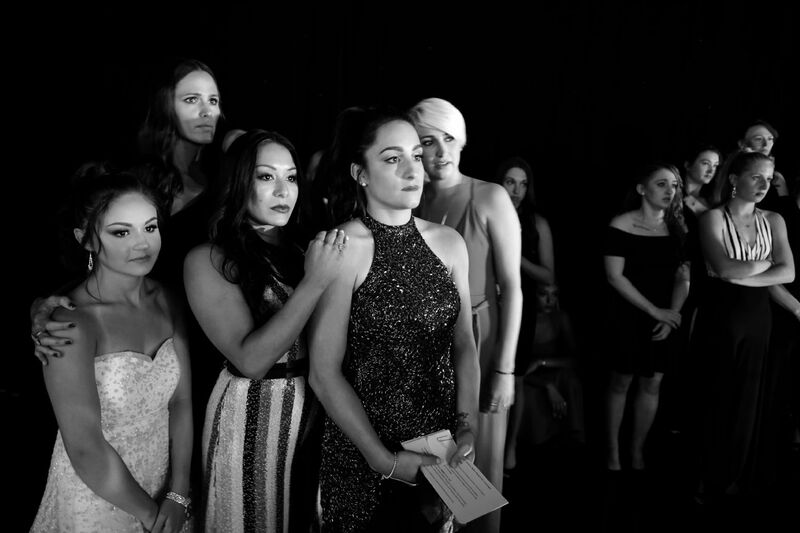 Before walking onstage in a stirring show of solidarity, many of the "sister survivors" who attended the ESPYS on Wednesday first walked the red carpet and met backstage -- preparing once again to display the strength and courage it took to expose a serial sexual abuser. As Sarah Klein said onstage, flanked by 140 other women, telling their stories publicly has not been easy. "It's grueling and it's painful," she said, "but it is time." 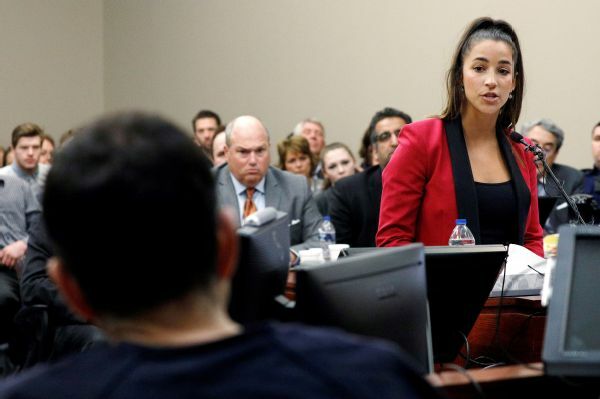 They suffered abuse alone at the hands of the disgraced former USA Gymnastics and Michigan State team doctor, but they survived together and put him away for life. Tiffany Thomas Lopez answers a question during an interview with fellow Arthur Ashe Courage Award recipients Jordyn Wieber, Sarah Klein and Aly Raisman on the red carpet for the 2018 ESPYS. Wieber, Klein and Raisman make their way along the red carpet to meet with other recipients; 141 were in attendance. Hannah Morrow shows the name on her wrist of another survivor, Grace, who was unable to attend the award show. Katelynne Hall, left, and Abigayle Bergeron pet a therapy dog from the Bark Therapy Dogs organization. Mariah McClain poses for a portrait. Photographer Randall Slavin did a quick portrait session with each of the award recipients in attendance. Odell Beckham Jr. chats with Raisman prior to the start of the ESPYS. Maggie Nicholas, left, and Lindsey Lemke pose with an ESPYS trophy. Actress Jennifer Garner embraces a woman and poses for photos backstage. Stephanie Robinson, front, walks outside the Microsoft Theatre as the group assembles to head in to receive their award. The 141 "sister survivors" in attendance all wait outside of the Microsoft Theater prior to entering the backstage area during the live ESPYS broadcast. Morgan Valley, left, and Meaghan Ashcraft, right, pose for a picture with a fellow award recipient behind the curtain. Nicole Soos looks around backstage as everyone waits to be ushered out in front of the audience. In an emotional moment minutes before walking out onstage, actress Jennifer Garner grasps the hand of one of the women receiving the award. 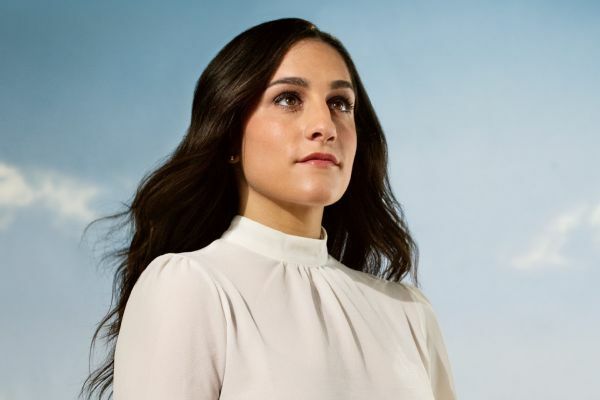 Jordyn Wieber, front, is surrounded by fellow recipients and actress Jennifer Garner, back, as they watch a video detailing the gymnasts sexual abuse. Ashley Yost, left, is led onstage as the crowd begins to move. After a long evening of waiting, recipients flood the stage to receive their award. Jennifer Hayes hugs Jill Berg, left, and Amanda Cormier and Kassie Powell hug onstage as the ESPYS come to a close.